This looks like a deep-sea diving helmet but is in fact a gas mask for babies, dating from World War II. In 1938, the British Government gave everyone, including babies, gas masks to protect them in case the Germans dropped poison gas bombs on Britain. This gas mask was for children up to two years old. The parents placed their baby inside the mask so that the head was inside the steel helmet and the baby could see through the visor. Then they wrapped the canvas part around the baby's body with the straps fastened under its bottom like a nappy, and its legs dangling free below. The canvas had a rubber coating to stop gas seeping through the material, and the straps were tied securely so that the mask was airtight. There is an asbestos filter on the side of the mask, and this absorbed poisonous gases. Attached to this is a rubber tube shaped like a concertina with a handle. This was pushed back and forth to pump air into the mask. With the baby inside the mask, an adult could start to use the hand pump. Health Visitors and Child Welfare Centres gave lessons on how to use the mask. Despite instruction courses, few parents were totally happy with encasing their child in an airtight chamber. In fact there was some question over its safety. During demonstrations there were reports that babies fell asleep and became unnaturally still inside the masks! It is likely that the pump didn't push enough air into the mask and the babies came close to suffocating. Luckily, they were never put to the test in a real situation. As well as the infant gas mask, there was a gas-proof pram that could be used to protect babies from poisonous gas attacks. As asbestos ages it breaks down. It is now known that there is a link between asbestos and lung disease. It is very important that all asbestos is professionally removed from old gas masks. In the build-up to World War II the British government feared that the Germans would attack Britain with poison gas. During World War I both the Germans and Allies had used poison gas in the trenches. Harmful gases can make the skin blister, cause blindness and breathing problems, and can even kill. The British government took precautions against poison gas attacks and by 1938 they had issued 'civilian type respirators' to every man, woman and child in the nation. There were versions for animals, too. Over 40 million gas masks were issued. People collected their gas masks from their local town halls or other distribution points organised by the borough councils. Officials made sure that the masks fitted properly and showed people how to put them on. Schools and workplaces also ran training courses from time to time in how to use the masks. The Government waged a publicity campaign. People were told to keep their gas masks with them day and night. Posters about the dangers of gas attacks were everywhere by the outbreak of war. For example: 'Hitler will send no warning - so always carry your gas mask'; 'It is your duty to yourself, your family and your country to be prepared. '; Don't be caught without your gas mask when the wardens sound their rattles'; 'Don't be a gas casualty.' Short films and radio adverts also kept people informed. There were events like 'Gas Mask Week' when talks on anti-gas measures were given in local town halls, and people could get their masks tested. The gas mask had nicknames from 'nosebag' after the feedbags that horse wore round their noses, to 'dickey-bird'. Many children called the gas mask a 'Hitler.' The gas mask was not popular and most people found it uncomfortable. It was tight fitting to prevent any fumes leaking into the mask. 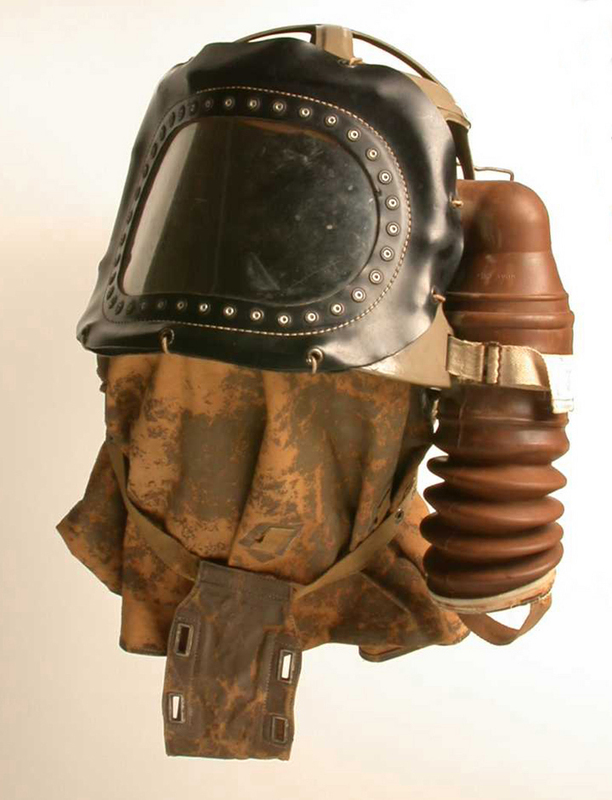 People sometimes felt claustrophobic and the wearer's breath tended to steam up the goggles after a few minutes. The sensation of clammy breathlessness and the smell of rubber disinfectant made people unwilling to practise wearing their masks. They also disliked carrying the masks everywhere. As the war progressed, it seemed less likely that there would be a gas attack and people tended to leave their cumbersome brown boxes and heavy gas masks at home. In fact, there never was a gas attack in Britain during World War II. As asbestos ages it breaks down. In recent years the link between asbestos and lung disease has become known. It is very important that all asbestos is professionally removed from old gas masks. A substance made of fibres, which was used in gas masks during World War II to filter out harmful gases. Asbestos is effective when it is new and stable but after a period of time it breaks down and it is possible to inhale the fibres. These can cause breathing problems and lead to asbestosis - a disease of the lungs. Old gas masks should never be worn due to the risk of inhaling asbestos. Claustrophobia - the fear of being in a confined space. To remove or separate particles from a liquid or gas using a filter substance. Inhale - to breathe in (air, smoke or vapour). A substance that causes death or injury when it is inhaled, absorbed or comes into contact with the skin. The First World War (1914-18) fought between the Allies (France, Russia, Britain, Italy, Australia, Canada and the USA) and the Central Powers (Germany, Austria-Hungary and Turkey).